This easy pie recipe is great for beginning bakers. 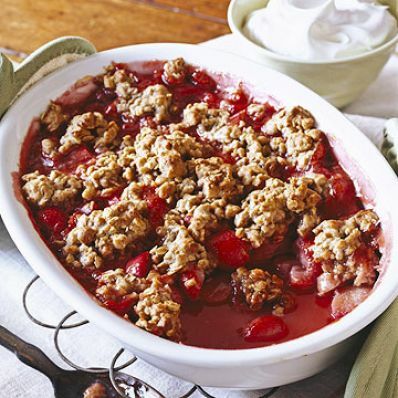 Use a refrigerated pie crust for the shell, fill it with the tasty combination of strawberry and rhubarb and top with a sweet brown sugar streusel. 1 of 1 Heat oven to 400 degrees F. Unfold pie crust; fit into 9-inch glass pie plate. 1 of 1 Toss together rhubarb, strawberries, granulated sugar and cornstarch in a large bowl. 1 of 2 In a separate bowl, combine flour and brown sugar; cut in butter until mixture is crumbly. Spoon berry mixture into pie crust; sprinkle evenly with topping. 2 of 2 Bake in 400 degree F oven for 50 to 55 minutes or until filling is bubbly and crust is medium-brown. If crust begins to darken too quickly, cover edge with aluminum foil; check after 15 minutes. Remove pie to wire rack and let cool to room temperature. Makes 8 servings.